HAVE A GREAT FALL AND WINTER! 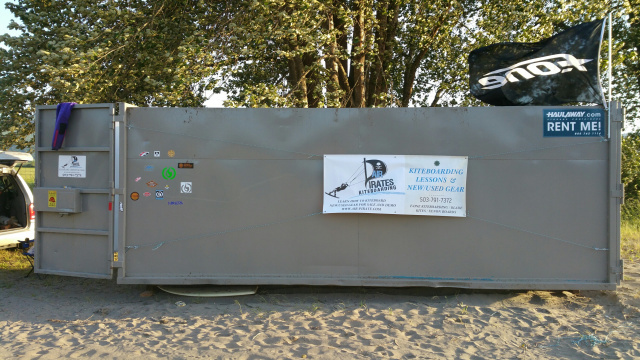 Watch and Learn WHY you want to take kiteboard lessons from Air Pirates Kiteboarding near Portland Oregon. Watch us teach, see the beach and see our students ride in only 1 day! We have the best beginner kite beach in all of Oregon and Washington. We are lucky to be FEATURED in Travel Oregon. Travel Oregon is The official guide to Oregon travel and tourism information. Jones Beach is in Oregon on Highway 30 between Astoria and Portland near a town called Clatskanie. It is only an hour from Portland Oregon. That's about the same amount of time it takes to drive to Hood River Oregon. Call (503) 791-7372 today and make an Appointment or Book Online. Jones Beach is famous for its consistant and steady winds. Jones Beach is rated the best place to learn to kiteboard in the entire Gorge!! Better than Hood River and NO CROWDS to worry about. Tons of space for everybody and steady winds. ONLY an hour from Portland Oregon and a 100 times more space! Additionally, we are the only company within hundreds of miles that offers kiteboarding lessons on the Oregon Coast. Kiteboarding lessons are here! Come take a kiteboarding lesson in Oregon, kiteboard Jones Beach Oregon or the Oregon Coast. We are mobile and offer kiteboarding in Oregon and kiteboarding in Washington. Take a kiteboard lesson in Kalama Washington, Astoria Oregon, Manzanita or Kiteboard in Cannon Beach. Kitesurfing on the Oregon coast is amazing and is year round....Even if the wind is light grab a surf board and kitesurf. It is safe and fun for the whole family. We accept Visa, MC, Debit, Discover, Paypal and Google Checkout. Check back often as we are constantly adding new products from top brands. Be sure to Check out our pages for useful information including, kiteboard reviews, weather, kiteboard lessons, We will be constantly updating and adding new information. Make us your one stop spot for everything kiting related. Happy Shopping and don't forget to take a kiteboarding lesson in Oregon, kiteboard lessons in hood river, kitesurf lessons in Washington or kitesurf lessons in Oregon.